Whats a Saucier? Sometimes called a chefs pan, this is a type of pan thats designed for repetitive stirring or whisking. The standard Saucier, like the Calphalon Saucier , has shallow, angled sides and a base smaller than the mouth of the pan. As the name implies, this particular pan gets used for sauces along with reductions, poaching, sautéing and braising. When shopping for a saucier there are several things for which to watch. A good saucier has a thicker bottom for even cooking and heat distribution. 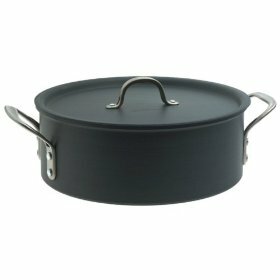 On average saucier pans wont hold more than 5 quarts with 3 quart being a commonly utilized size (and a diameter of 10). Always check the handle of potential saucier pans to make sure youre comfortable with the weight and size. The Calphalon saucier appears to fit all the requirements of an excellent saucier that will brown, deglaze, caramelize, and sear. Its made with the classic Calphalon cool touch handles thats ergonomically designed. The double-handled design on this large saucier is a real selling point as its creates safer mobility especially when the pan is filled with food. Performance wise Calphalon provides very uniform heating (this lowers your overall energy consumption in the kitchen) and an anodized surface that doesnt react with acidic food. Better still, if need be it can go from stovetop to oven without issue. Its safe to 700 degrees! This particular piece is on the LARGE side of saucier pans (nearly 13 x 14 and 5 tall). That means it needs some serious space on the cook top. These pans are not dish washer safe, so clean up will take a little longer. Warning: putting the saucier in the dishwasher voids the lifetime warranty. If you want to protect your investment, wash by hand. The Calphalon saucier is getting very strong consumer reviews on all levels from overall appearance, affordability, durability, and definitely for performance. It seems that the pan heats so well people find they have to turn down the heat on the stove to moderate the foods cooking time. This is a GOOD feature -- it just takes a little practice to get used to how quickly this pan warms up. About the only complaints out there were about the size being a little difficult to manage if you have a stove full of other things cooking, and one person reported warping  but that seems to be an isolated issue that could have happened due to improper maintenance. In my opinion the Calphalon saucier is well worth the price of $79.00. Its versatile, big enough to make good-sized meals for a family, and its going to last you a very long time if cared for properly. Calphalon is a name people have come to trust in cookware and this item does not disappoint in the least. Amazon also offers the saucier pan in different sizes and types of cookware.